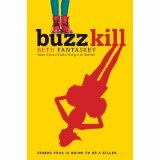 This YA novel by Beth Fantaskey was refreshing because it didn’t aspire to more than it was. Millie Ostermeyer is a high-school senior who discovers the bludgeoned body of Honeywell High’s not-so-beloved football coach while covering a story for the school paper. Her father, the mayor and the assistant football coach, quickly becomes the prime suspect because apparently being the head football coach is every man’s grand life ambition. Millie sets out to discover who murdered the coach with the aid of the hot quarterback Chase Albright, a young man with his own mysterious past that Millie wants to unravel. This was a funny book and really cute. I really enjoyed the fact that the tone was very appropriate to the age group. It also mentioned Nancy Drew and Millie had “her librarian,” Ms. Parkins, to help guide her in her information searches and in life. I’d give it a solid B. This entry was posted on June 24, 2014 at 7:56 pm and is filed under Teen Readers Advisory. You can follow any responses to this entry through the RSS 2.0 feed. You can leave a response, or trackback from your own site.